Specializing in Trooper and Western saddles. Great deals on bridles, breast straps, and more! I’m Kevin Parrish, but most people know me as The Saddle Guy. Some of my earliest memories are of the rhythmic pounding of my father’s mallet, the smell of old leather and horse sweat, and the feel of a new piece of fine-made tack. While most boys were playing with toy trucks under the kitchen table, I was learning life lessons, fixing saddles, and developing a passion for making fine, handcrafted leather goods. I’ve spent nearly 30 years learning and refining techniques to build the finest possible catalog of saddles and tack for field and trail. Whether I’m building your dream saddle or reviving an old favorite, your satisfaction is my top priority. I’ve listed some of my most popular items below, but visit the shop for a complete list. Interested in some custom work? Or just have a question? Contact me, and let me know how I can help. Thank you for taking your time to visit my site. 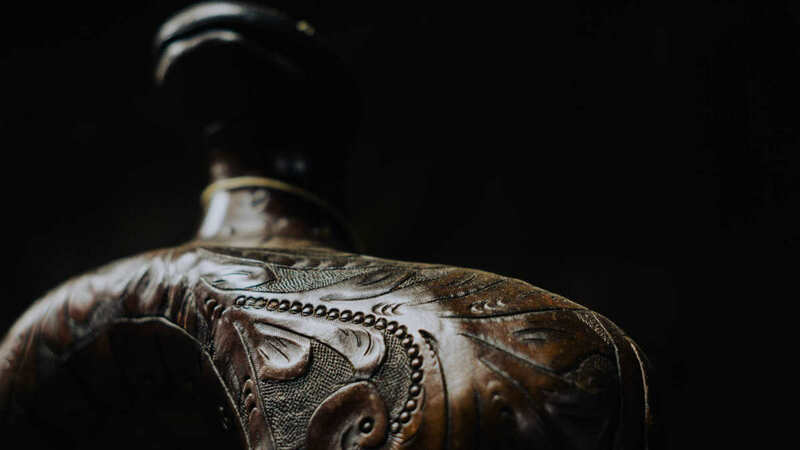 Four decades ago, my father’s saddle shop established a respected, time-honored legacy of Parrish saddlemakers. As a young teen, I worked many long, summer days by his side, learning the ins-and-outs of saddlery. Since his passing, I’ve carried on the family trade, creating my own shop, The Saddle Guy, in 2005. By only using fine, American leather and local craftsmanship, I’ve ensured these saddles are built to last. Nobody invests in a saddle expecting to replace it in four years. If properly cared for, they should last a lifetime. That’s my attitude. Visit the shop to see my work, or scroll down to read testimonials from satisfied customers. There’s a little joke I like to tell people, “I don’t just build saddles. I build relationships.” If not for my customers, I wouldn’t be able to live out my passion. That’s why there’s a contact form at the bottom of this page. And if you have a problem, I want to help. I believe in making things right. If there’s an issue, we’ll fix it. Kevin made a beautiful bridle and breast strap for me in black with silver conchos. Everywhere I go, people comment on how beautiful it is. It truly stands out on my blue roan. I am very pleased with my trooper saddle that you built for me. It is now starting to relax down and break in. It is the most comfortable saddle I have ever ridden. He has taken the best of both worlds to create a saddle that is custom-made with attributes of mass production. There is no doubt in my mind that Kevin Parrish loves what he does and cares enough about quality that he makes one of the best saddles produced today. Have a question? Need some custom work? Contact me below and let me know.